As with each and every day this week, so many wonderful ideas. Today I chose to follow the wonderful Julie Ebersole’s lead. Julie has such a clean, amazing sense of design! So while I followed her basic idea, I made it my own by stamping the images from the Penny Black Festive Florals and watercoloring the background making sort of a tapestry look. A few of Tim’s stars and done! It’s Day 3 of the Merry Making class and again so many great ideas and tips! I focused on a design from May Park. 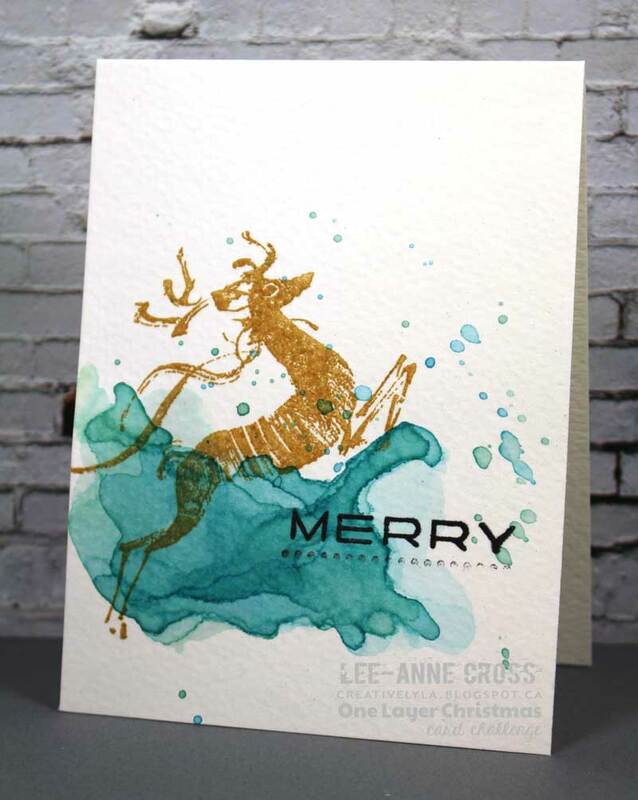 It’s fun, it’s fresh and quite unique for a Christmas design. No, not the food kind 🙂 This is a leftover background from my Holiday Coffee Lovers design last week. Not wanting to waste my Distress Inks and Inka Gold left on my craft mat… this is my “mop up” paper. It was flicked with water and then dried. And, speaking of flicking, after the tree was stamped, I flicked on some thinned white acrylic paint for a snowy effect. Very simple and easy to do if you’re still trying to get some cards completed! 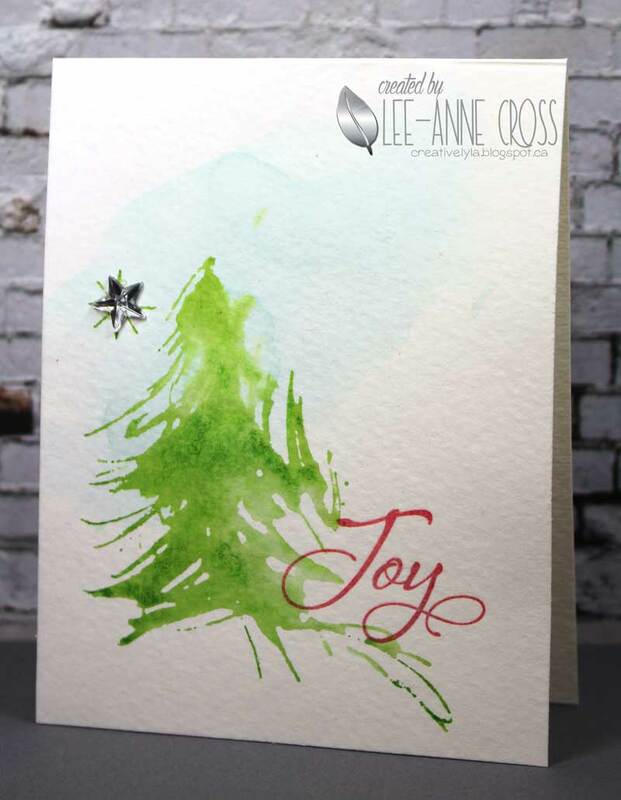 The tree is from Penny Black…one of my oldest and yet still favorite stamps, and the sentiment is from Verve. Hello! 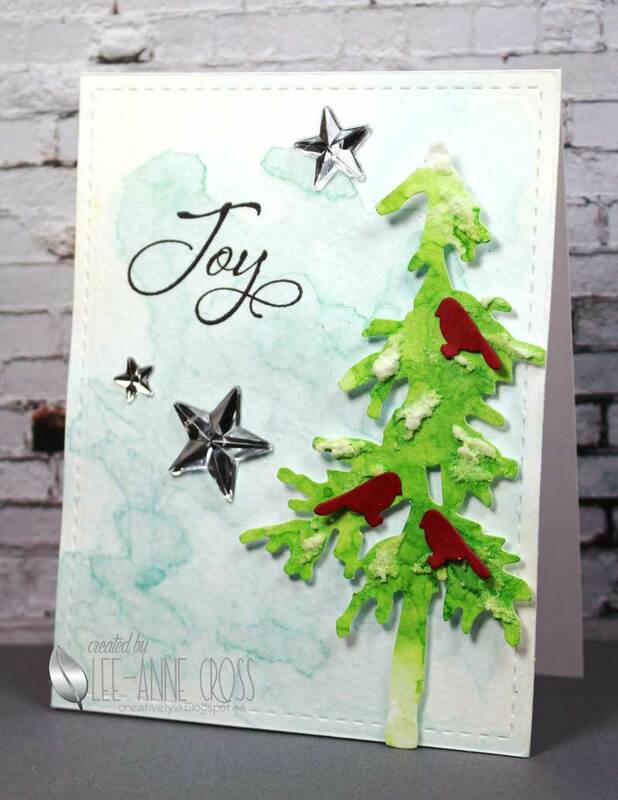 I’m sharing my guest designer cards for the Splitcoaststampers color challenge this week. The colors we’re working with are Cherry Cobbler, Soft Sky and Wild Wasabi, and our dessert option this week is to make two cards…one CAS and one more fussy. My CAS design starts with a soft watercolor wash in blue. Next I inked up my Penny Black tree stamp with the green ink and spritzed it lightly with water before stamping, and then added the sentiment from Verve and a crystal star. Basically the same steps for the more detailed card…but I added several layers of the blue for the background. 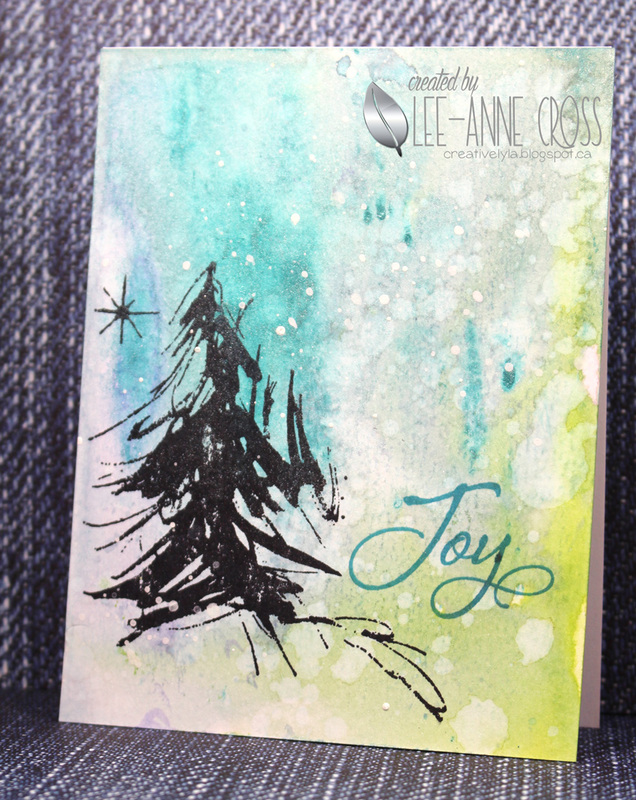 Using the same technique on a separate sheet of watercolor paper, I then die cut the Tim Holtz tree and added some Finnabair Snowflake Paste. The little PTI cardinals were cut out of Cherry Cobbler and the same crystal stars were used for a bit more sparkle. The challenges are always one layer, always anything goes and this week’s optional twist is “reindeer”. As always, the challenge is to create a one layer card only and if you use the optional twist, you’ll be entered into the monthly random drawing. Each card = one entry, so feel free to enter often to increase your chances to win. I’m all about quick and easy Christmas cards and this was done in under 10 minutes. 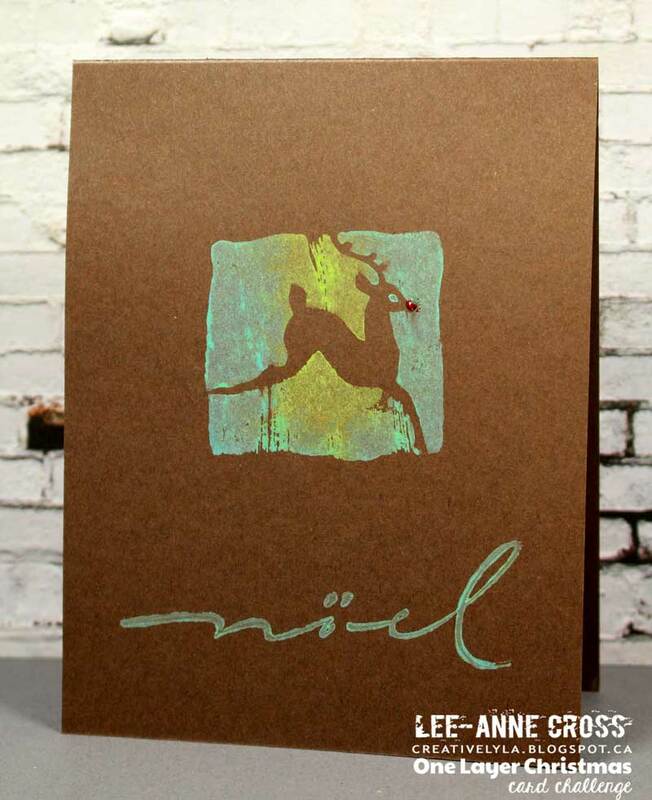 Just added paint to my stamps – the reindeer was done in two colors, while the sentiment was just one color. Then a cute little red nose with Stickles and done! How’s that for fast? Check out the cards from the rest of the Design Team right here.